Moving the Needle: Ryan Sweeney doubles home the tying run and sets up more, +.392 WPA. Down 2-1 in the eighth, the A’s started to rally, putting runners on first and second with one out. Sweeney came through with a bloop to left that brought the tying run around and set up second and third, giving them a chance to go ahead without a hit. But they didn’t take the lead, and it cost them in extras. Craig Brewslow surrendered two in the 12th, and while Sweeney drove in a run to cut the deficit, Hideki Matsui cold not come through to bring home the runner from third with two outs. Brett Anderson: 9 IP, 7 H, 2 R, 2 ER, 0 BB, 5 K, 0 HR, 20 GB. Seriously, standing O for Anderson. Tough luck in this one. Jack Hannahan: 1 for 5. That’s not much in the box score, but he drove in the go-ahead run in the 12th. Lou Marson: 3 for 5, 1 3B. His 12th inning single also gave the Indians a needed insurance run. Moving the Needle: Alberto Callaspo doubles home a pair, +.167 WPA. In an 11-0 game, this is a pretty big swing. That’s because it came in the third, when it was still a 1-0 contest. Callaspo extended that to 3-0 with a double to right, scoring men from first and third. 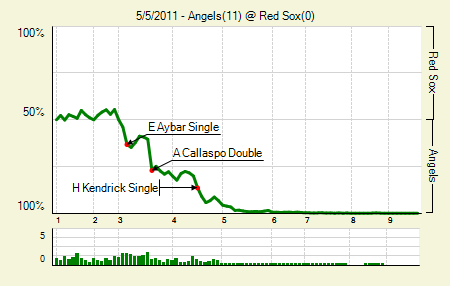 The Angels would take on three more in the fourth and two in the fifth to put a bow on this one. Howie Kendrick: 3 for 6. His wOBA stands at .397 on the season. He is also 12 for his last 31, though only two of those hits are of the extra base variety. Peter Bourjos: 3 for 4, 1 2B, 1 HBP. He came around to score all four times on base. That’s his first extra base hit since he tripled twice on April 26th. 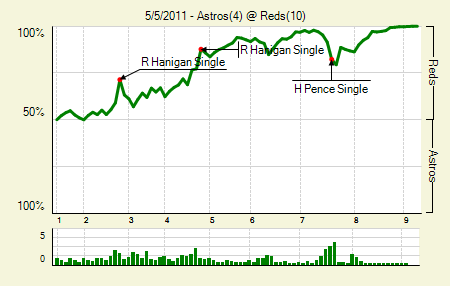 Moving the Needle: Hunter Pence gives the Astros some late life, +.151 WPA. By the end of six the Reds had taken a 5-1 lead, but the Astros battled back in the seventh. They loaded up the bases and then scored on a walk. The next batter, Pence, grounded one between third and short, which was enough to plate a pair and make it a 6-4 game. Bill Bray then came in to clean up Aroldis Chapman’s mess, and after he shut them down the Reds tacked on four in the eighth. Homer Bailey: 6 IP, 4 H, 1 R, 1 ER, 1 BB, 7 K. A fine first start for him, at a time when the Reds rotation really needs it. Jay Bruce: 3 for 4, 1 2B, 1 HR. He’s 9 for his last 25 with two doubles and three homers. It’s a nice way to start working out of a slow start. Ryan Hanigan: 3 for 4. They might have all been singles, but they helped drive in three runs. Moving the Needle: Brennan Boesch ties the game in the sixth, +.169 WPA. 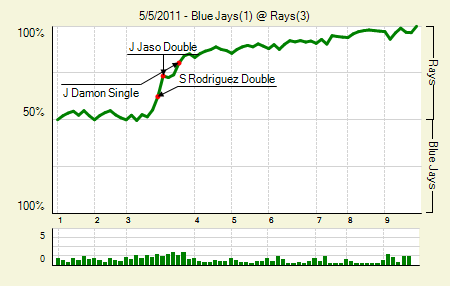 Ramon Santiago was a pain for the Yankees in the first game of the series, going 3 for 4. He got right back on that yesterday by singling to start the sixth and eventually coming around to score the tying run on Boesch’s single. 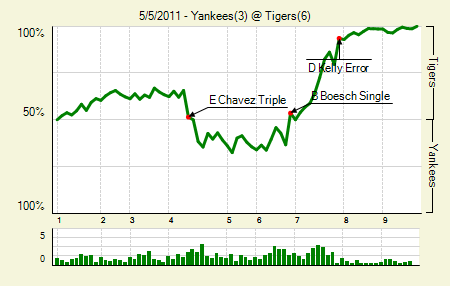 Boesch, too, caused headaches, going 4 for 7 in the final two games of the set. He brought home the first, second, and sixth runs of this game. Rick Porcello: 7 IP, 8 H, 2 R, 2 ER, 2 BB 3 K, 0 HR, 9 GB. Not stellar, but in a game like this, in which errors led to many runs, he definitely gets the nod. Bret Gardner: 2 for 5. Just noting because he was back in the leadoff spot. 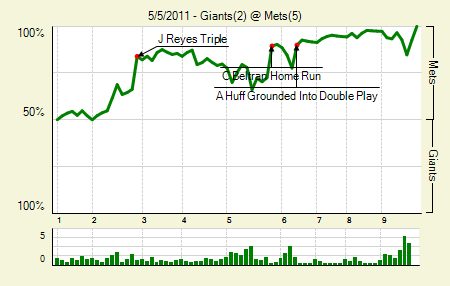 Moving the Needle: Jose Reyes triples home two, +.176 WPA. Reyes had himself a quality series, going 4 for 11 with a double and a triple, the latter coming yesterday and putting the Mets up 3-0, which would have carried them if it had come down to it. After tough losses in the previous two games, the Mets needed this one. Carlos Beltran: 1 for 4, 1 HR. Selfish Beltran pads his stats with a two-run homer when his team already had the lead. 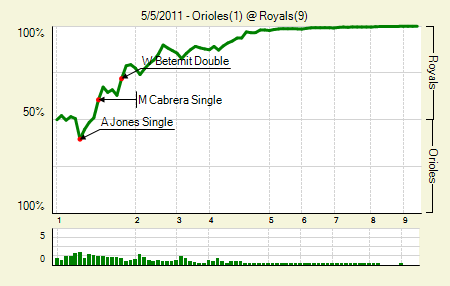 Moving the Needle: Adam Jones opens the scoring with a single, +.110 WPA. Yep. In a nine-to-freaking-one game the first run, by the losing team, is the high WPA mark. The Royals wouldn’t let that stand, though, as they singled the Orioles to death in the bottom half of the first. By the end of the frame they had a 5-1 lead, and they’d increase that to 7-1 by the fourth. Bigger news than the win, of course, is that Eric Hosmer is on his way to the bigs. Melky Cabrera: 3 for 4, 1 2B, 1 HR, 1 BB. He drove in four and scored three, making him the clear offensive force in this one. Bruce Chen: 7 IP, 5 H, 1 R, 1 ER, 2 BB, 5 K. He kept the ball in the yard, and therefore pitched well. Sure, that’s true of most pitchers, but it’s really Chen’s thing. 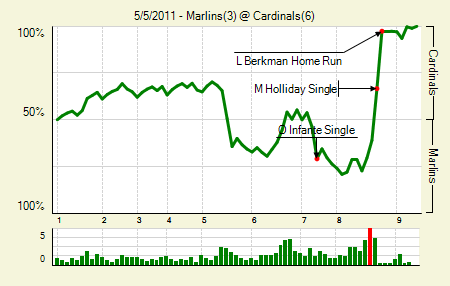 Moving the Needle: Lance Berkman completes the comeback with a three-run shot, +.307 WPA. Down 3-2 headed into the eighth, the Cardinals needed a rally. Good thing they had the top of the order due up. The usual suspects, Rasmus and Pujols, set the table, while Matt Holliday drove home the tying run. Then came Lance Berkman, who, after a couple of hitless days and no hits previously in the game, blasted a three-run homer well over the left field wall to give his team the lead, which was more than enough cushion for the bullpen. Albert Pujols: 3 for 3, 1 BB. That’s three singles, but it’s also a perfect day. It’s safe to say that everyone’s happy with that. Omar Infante: 2 for 3. He drove in two of three. He had a quality series, going 6 for 18 with a double. 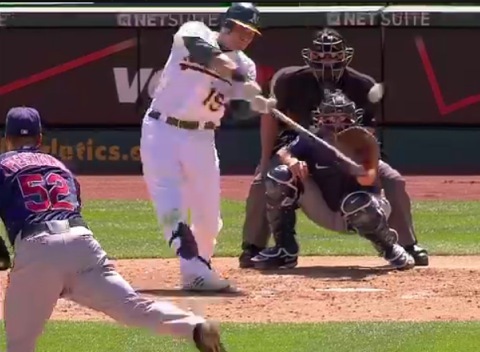 Moving the Needle: John Jaso doubles home the first run, +.111 WPA. It feels as though it’s been a while since Jaso appeared in these spaces. Today he makes it back with an RBI double that opened the scoring in the third. Johnny Damon would follow up by driving him home, and Matt Joyce added a sac fly to complete the three-run inning. The Rays pitching took it the rest of the way. David Price: 8.2 IP, 4 H, 1 R, 0 ER, 0 BB, 10 K. The scary part is that he has the potential to do this in any start. He won’t do it every time, of course, but anyone facing him knows it’s a possibility. 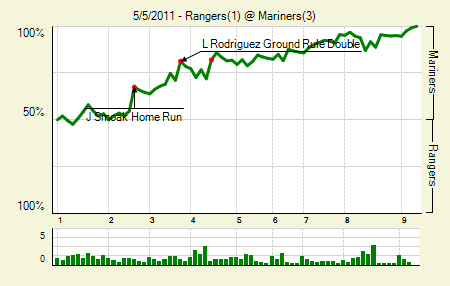 Moving the Needle: Chris Young homers with two outs in the bottom of the ninth to tie the game. The Diamondbacks were down 2-0 heading into the ninth, but a pair of homers tied it and forced extra innings. The second one came off Young’s bat. He reached out and pulled a breaking ball, tying the game and giving his team a new life. 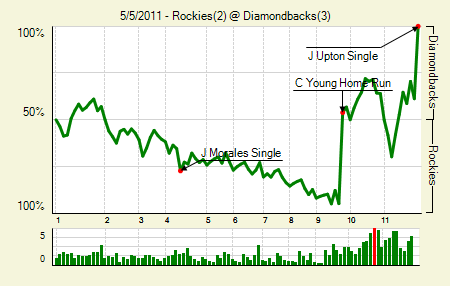 They took advantage in the 11th when Justin Upton, hitless in 5 PA to that point, singled home Young from second. Young also had two doubles on the day. Jason Hammel: 7 IP, 4 H, 0 R, 0 ER, 3 BB, 4 K. It wasn’t the prettiest of starts, but hey, sometimes your closer blows it. Gerrardo Parra: 2 for 5, 1 HR. He put the DBacks on the board for the first time. Moving the Needle: Martin Prado delivers the lead with a homer, +.268 WPA. 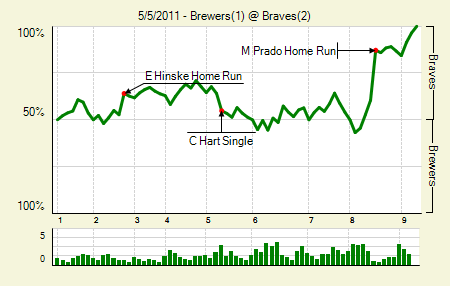 After a pair of eight-run outbursts on Wednesday the Braves looked a bit more normal yesterday. The Brewers, of course, continued to struggle on offense, so when Prado took Kameron Loe deep to open the eighth, their remaining chances weren’t good. They had a few opportunities early, but once the back end of the Braves pen got involved, it was lights out. Brandon Beachy: 6 IP, 4 H, 1 R, 0 Er, 1 BB, 9 K. You see this coming? I didn’t see this coming. Shaun Marcum: 7 IP, 5 H, 1 R, 1 ER, 1 BB, 5 K, 1 HR. The walk was intentional. Now that he’s going well and Zack Greinke is back, the Brewers don’t seem too far from a big run that could change the face of the NL Central. Eric Hinske: 2 for 4, 1 HR. First time I’ve written his name this season, I think. Moving the Needle: Justin Smoak homers to open the scoring, +.130 WPA. This was a slow death kinda game for Texas, as they fell behind early and really couldn’t get the bats going. They did pick up a run in the eighth, but by that time it was already 3-0. The rally would not last, though. Smoak went 3 for 4 in the game, with a double in addition to the homer. His wOBA is up to .423, and I imagine Mariners fans are giddily smiling right now. Jason Vargas: 7.2 IP, 6 H, 1 R, 1 ER, 2 BB, 3 K, 0 HR. It was something of a magician’s act, since he allowed as many fly balls as ground balls. Still, another solid effort by Vargas. Colby Lewis: 8 IP, 8 H, 3 R, 3 ER, 1 BB, 11 K, 1 HR. On most nights, with the Rangers offense, he has a W next to his name. But they just couldn’t cash in most of their nine base runners. 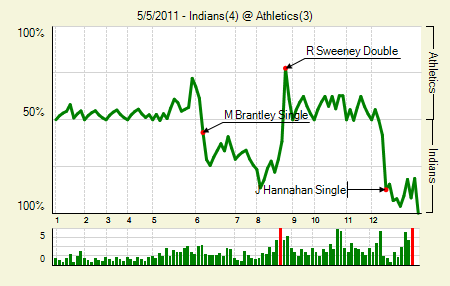 Moving the Needle: Shane Victorino opens things with a two-run homer in the third, +.177 WPA. 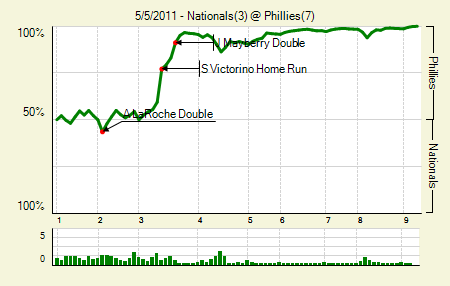 How much can you really say about a game where the Phillies jumped out to a 5-0 lead after three? With that pitching staff they might give up runs here and there, but chances are they’re not giving back five runs. Seriously, while writing up the Phillies games this week I’ve gotten the feeling that they may never lose a game again. Roy Halladay: 7 IP, 6 H, 2 R, 2 ER, 0 BB, 10 K. No comment. Raul Ibanez: 3 for 4, 1 2B, 1 HR. Making up for lost time, I see. We hoped you liked reading The Morning After: Game Recaps for May 5th by Joe Pawlikowski! I love looking at these graphs – thanks for posting them every day! I have a question, though – can the graphs only be made after the game has been completed, or would it be possible to see one being built while the game is in progress? The Live Scoreboard has every game as it happens. Shouting out WE% swings in the bar is a great way to meet people. Thanks! I’ll have to keep an eye on that the next time I’m watching a game.